Gary Bowyer says tomorrow’s clash against Bristol Rovers gives his side the perfect opportunity to turn around their wretched home form. The Seasiders have gone seven games without a win on home turf, last picking up three points against Bury back in October. Pool’s home form was key to their impressive displays at the start of the season, remaining unbeaten for six games before they went down to a 3-1 defeat to runaway leaders Wigan Athletic. But since then, Bowyer’s side have lost four of their last six games at Bloomfield Road. “It’s another home game and we know we have to change that record,” Bowyer said. “I would argue our performances and form have actually been very impressive, it’s just the results that have not gone our way. “But we know we have to do everything in our power to change it around. “Our performance at Oxford was very good last weekend but we can’t just keep saying it, we’ve got to deliver. “Obviously should you win games then it makes your performance look even better. But we had 60 per cent possession against Oxford. Bristol Rovers, who currently sit one position below Blackpool in the league table, travel to Bloomfield Road having not played since New Year’s Day. 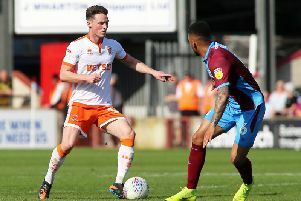 The Seasiders, meanwhile, have played two games since then – the latter of which saw them knocked out of the Checkatrade Trophy when they went down to a penalty shootout defeat to Shrewsbury Town on Wednesday. Bowyer added: “It has been well documented what my thoughts were of the competition in the past but my attitude changed a little this season, so I was gutted to go out. “We were only two games from Wembley and obviously with us winning there last season, we wanted to return.